I think this may be one of my favorite style boards I have put together recently. I modeled it after a blogger I saw recently that wore camo paired with white and grey. I was just wondering if camo was still something that was on-trend - and I think it is. The big Nordstrom Anniversary sale has a few camo pieces - like this bomber jacket and this shirt jacket. This outfit is pretty easy to put together with some basic staples - like white jeans (these are only $10) and a grey tee. As far as the #nsale, it's been like Christmas at my house each day. I feel for my UPS guy though - as I sort through everything that I want to keep and return. My door is piled with boxes. For some reason, Nordstrom tends to send everything from different locations. So, each item gets its own box. And, since most of the good stuff sells out quickly - I typically order a couple of sizes - so it is a little crazy at my house lately. As far as what I have liked and those things I wished I hadn't ordered. Here are a few of my hits and misses. These boots were a definite HIT. This was a MISS - I loved the color - but the fit was off for me. Another hit was this sweater - it is a great price and will be perfect for fall. I am on the fence about this sweater. I love the look of it - but the dolman sleeves (that attach at the waist, which the online pictures do not show) are kind of awkward. Oh, and one other miss was these boots. I have looked at them for the past two years - and really think they are cute - but I cannot pull them off. I felt like I should audition for the Dallas Cowboy cheerleaders in them. 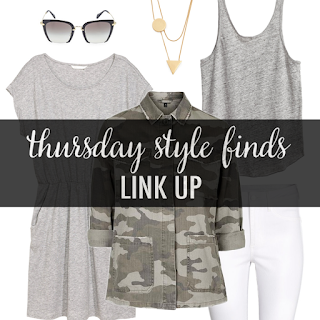 Super fun picks Lisa, love the gray, white and Camo. My boxes are still tricking in, lol. I love this style board and need to recreate this look! That v-neck pullover you picked up at the sale will be perfect for fall! Love this look- the white tones down the camo and makes it perfect for summer! 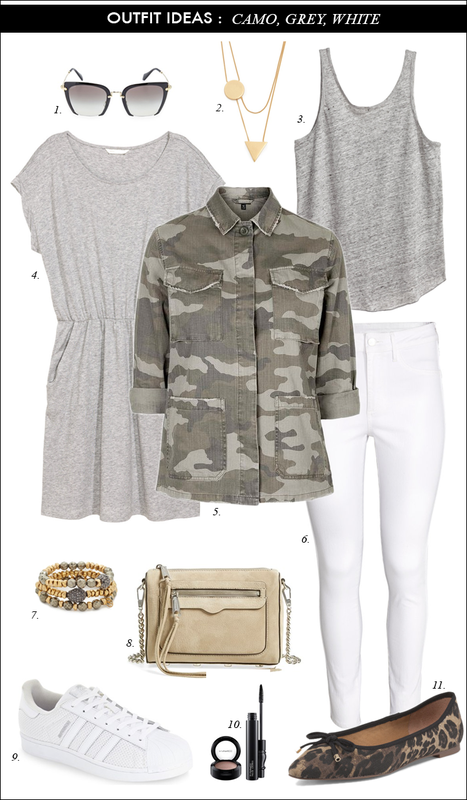 Love the light colored neutrals paired with camo! Great inspiration! I don't own any camo, but you are making me think I should! I am still waiting impatiently for my purchases. Love the camo look! Love that grey jersey dress! Girl! Forget the sale. I may have to come shop your front hallway! Thanks for linking up with the mid week I Feel Pretty link up this week and entering to win that $250 Nordstrom gift card. I like the board a lot too! There is something so soothing about the colors! I love those animal print flats! Both looks are cool and stylish! Love this outfit! Totally copying it! I feel so bad for our ups guy, it's a everyday cycle! Love this! Need to get to a real computer to check out your hits and misses, work doesn't let me click on anything :) Wait..I'm working, I really am. Ok I need that camo jacket! Its fabulous! Love your picks in shades of grey! The cameo jacket is amazing, as is the necklace with the different geometric shapes! Thanks for sharing and hosting! I need something camp in my life for fall! Thanks for linking up to Top of the World Style. Please add me to your email reminder list for your party. Thanks. I really need to add some camo to my wardrobe!! That camo jacket is pretty amazing. I just really love the fitted styling. 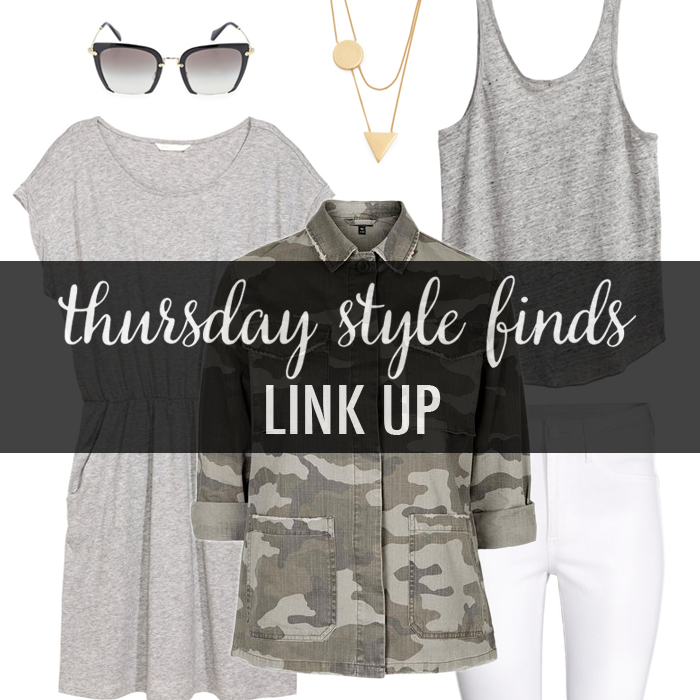 I'm loving both of these gray + white + camo looks! I haven't yet shopped the NSale but hope to do a little today! I don't know what it is, but I just can't do the camp trend. But I totally love the grey on white and need to do that ASAP! I love this outfit you created, so chic! I have a similar camo jacket that's been MIA and I need to find it. Love the looks you put together. Don't Miss Nordstrom's Best Sale!